Each one of the six sections should have some kind of assessment or wrap-up discussion, a place for students to reflect and analyze findings before they go on to the next section. Educator should encourage students to step back regularly to understand what was done in each step. The EdGCM preview video might not be engaging for students. Wrap-up suggestion: Limitations of models, what have we figured out about models, learning about models. Activity allows students to really use modeling software and produce an interpretable result. Modeling and how scientists do science is clearly represented. Students who can maneuver the lessons will gain an understanding of climate science concepts. Very well referenced, with plentiful links to data sources and background references. Students must have a good understanding of climate, the cryosphere, and technology. Does not provide enough explanation about the IPCC scenario that produces this CO2 increase, and not enough information is provided on how the model arrives at its conclusions. It's somewhat of a "black box." Activity doesn't address climate change; it gets more into the understanding of feedbacks. Activity takes good advantage of using the modeling software EdGCM. Comment from scientist: Reference is made to "snow and ice coverage." Clarify if you refer to sea ice, land ice, or both in your lesson. Instead of directing the students to the IPCC report, it might better to direct them to the Summary for Policymakers report since that is a less technical, shorter, and easier to digest document http://www.ipcc.ch/pdf/assessment-report/ar4/wg1/ar4-wg1-spm.pdf. Well organized and rich resource, albeit complex, which requires a lot of preparation work for the educator. 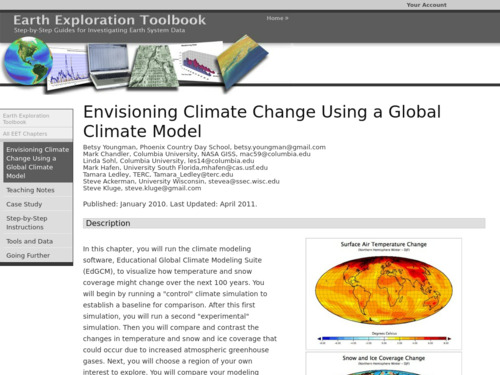 Great material if the educator wants to engage students in climate modeling. A lot of preparation is needed before educator can use the tool. This is not a "Click and go" lesson. There are costs associated with this lesson, and participation in available professional development programs is strongly recommended. Quite a commitment for a teacher but might be well worth the effort. Very challenging material will be difficult for students lacking a good understanding of technology, second language learners, and teachers that lack tech support. Assumes student ability to follow directions explicitly â could be a barrier to some students who may lose interest in the many detailed steps. There is a risk that this activity could be a cookie-cutter exercise unless the educator really encourages thoughtful reflection and discussion. Prerequisite understanding of climate system science is not highlighted enough as well as the ability to understand the modeling procedure and outcomes. This activity does not promote any understanding of the factors that cause climate change; additional instruction would be necessary to address those ideas. Very clear, extremely detailed, and visually-cued directions. Requires a lot of tech support for teachers and students alike. Software installation is required and might be a barrier in many school districts. Data files are very large. Only available at cost after a test period. Some of the extensions are Mac-only. Some links to external resources are no longer functional, but links to key resources work.